Weather: We don’t usually address the weather, since we get snow, ice, sleet, and cold -and that is what makes this race ‘fun’! As in the past this year there is a chance of rain and/or ice and/or snow race morning. If the trails aren’t runnable, we will have the race courses on the levy, but that is only if the trails are un-runnable per the ‘Trail Guardians.’ If there is lightning within a mile of us, we will delay the race/pull runners from the course (if possible) if it’s in process, until we are clear. As you’ll see throughout, your safety is important to us. Keep an eye on the Facebook page and your email, we will be contacting you both ways should anything change. PARKING: There is parking available past the levy, however, please be aware of the time, as access to this area will be restricted during race start times. If you park on the road into the park, remember (and tell your supporters as well) that runners will be coming down this way (the red start arrow). Do not block the road, or keep your doors open. If you park on adjacent streets, such as Oak St, please remember that people live there and they will need to get out of their houses too & traffic should be able to flow down the street. There will be some No Parking signs on one side of Oak to help with this. PI MILER COURSE Gather at the gate/starting line no later than 7:50am. The run will begin at 8:00 A.M. Participants must be registered with their bib by this point. 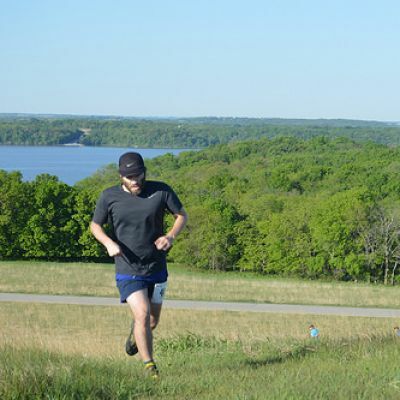 A volunteer from the Lawrence Mountain Bike Club will lead the first loop of the race for runners. The run will start at the Lawrence levy gate, going into the River Trails parking lot. It will go down into the main trail entrance on the South Side and go approximately 1.4 miles before making a turn and heading back to the trail head (known to some as the ‘powerline field’). There will be a course director here to help runners on their way. At one point runners will exit the trees and run along a fence and the trail will split, going North (right) to the finish line and South (left) to the trail head. On the first loop, runners will go left (South) to the trail head. At the trail head, runners will be expected to run to a designated point and then head back out on the trail in the same clockwise direction. There is an aid station at this point that runners may use if needed. 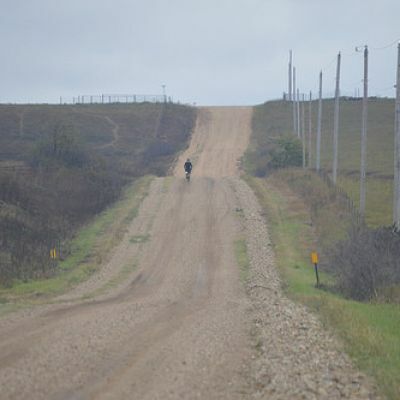 On the second loop, the runners will go out approximately 0.4 miles from the trail head and then turn for the last loop (known to your RD as Ol’ Tree Face). There will be a course director here to help runners on their way. On this last loop, at the fence, runners will go North (right) and head to the finish line, where they will be met with much rejoicing and pie! Awards will be given starting at 8:35am at the starting line, prior to the Half Marathon start. PACKET PICKUP: 3pm-7pm at Garry Gribbles Running, 839 Massachusetts St , Lawrence, Kansas 66044 Phone Number: (785) 856-0434 You can also get your packet starting at 7 A.M. on race day at the registration tent. Emergency Plans and Information If you for some reason cannot finish the race, you must check-out with a Race Director (Libby or Caroline) before departure. We will have a sweeper on the course starting after the last runner has begun their last loop. They will not pass anyone and will ensure that the path is empty when they get back. The LMBC Bike Patrol will be on the trails to ensure safety and to keep you on the right path. In case of inclement weather, please keep an eye on the Facebook page and your emails. Your safety and the longevity of the trails is our main concerns. Both stations will be equipped with a first aid kit. For non-emergency situations, participants will be treated with the first aid kit. For emergency situations, a representative of the Wakarusa Township Fire Department will be on hand and we will contact Lawrence Memorial Hospital/911. We will also contact the person listed as the emergency contact on the participants registration form. We will have heaters and warming tents for before and after your race. Runner will have first access over spectators. Guidelines: The parking lot past the levy will not have access from 7:45 a.m. until 8:20 a.m. during the Pi Miler start and again from 8:35 a.m. –9:20 a.m. for the beginning of the Half Marathon. Both races start at the levy gate into the park, run through the parking lot and on to the trails. Please be mindful of that when parking and don’t block the path. Bibs need to be worn on the chest, and try not to bend the chip on the back of it. 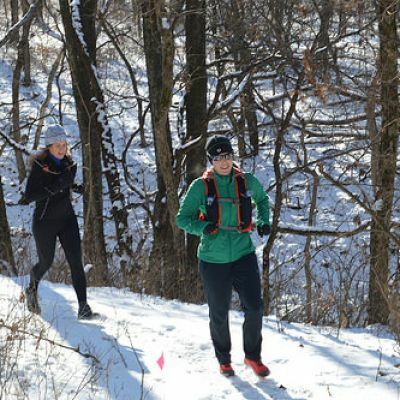 As trail runners, and with layers, this is not the easiest, but this is how we get your race results. Music/Ipods/Headphones: We ask that you leave your headphones at home. We strongly discourage the use of headphones as it detracts from the whole trail experience as well as limits your interaction with others and your environment. We have found historically that runners wearing headphones tend to get lost more frequently, miss trail directions and are unaware of other runners trying to pass. you must wear them only have one ear bud in so that you can hear if a course director or fellow runner needs to tell/warn you of something. If you choose to ignore this rule you run the risk of going off course, going the wrong direction, going extra miles, etc. PLEASE pay attention to our volunteer course directors and fellow runners! The River Trails are not that wide, we ask that if you can leave your pet at home, please do so. If you do decide to run with, or bring along for cheering, a four legged pal (or a parrot?!? ), they must be on a leash and -do not get in other runners’ ways or bother other participants/volunteers. Garbage—Please abid by the “take out what you bring in and leave nothing byt footprints” moto. Leave all garbage at aid stations. Those found to break this rule will be disqualified. 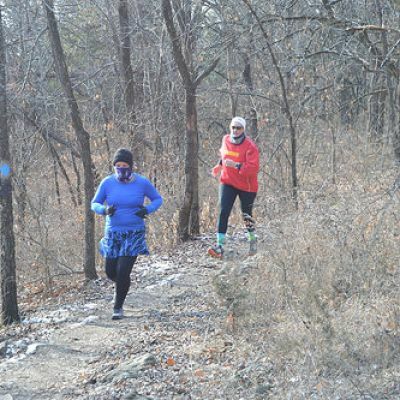 Other Stuff: A quick moving trail runner, especially one who seemingly emerges from out of nowhere on an unsuspecting trail user, can be quite alarming. Give a courteous and audible announcement well in advance of your presence and intention to pass others on the trail stating something like, “On your left,” as you approach. Keep in mind your announcement doesn’t work well for those who are wearing headphones and blasting music. Show respect when passing, by slowing down or stopping if necessary to prevent accidental contact. Be ready to yield to all other trail users (bikers/hikers) even if you have the posted right of way. Uphill runners yield to downhill runners in most situations. Take care of yourself! Not in the “we won’t help you” way, but in the “pay attention to how your body is being effected by the weather.” We have warm spots for you and warm things for inside you. You don’t want to have to join Story Hawk in a tale of frostbite! We do not condone bandit runners. only are bandits a serious safety and liability concern they can jeopardize the issuance of future permits and insurance. Good to Know: Chip timing on your bibs is being handled by RaceDay Timing. We’re excited to have them back. Mile 90 Photography will be at the finish line and on the trails taking your pics. They’ll let us know on our Facebook page when they are all loaded and ready to look at after the race. Celestial Bakery is providing pies at the finish line again this year. All sorts of pies, vegan pies too, for all our runners! Garry Gribbles is not only your place for packet pickups on Friday, but they are also sponsoring race place prizes! Don't forget, that after you get your yummy pie from Celestial Bakery, you and your supporters can grab a pie to take home from volunteers from the Relay For Life of Douglas County. They'll be out there selling fruit ($12) and cream pies ($10), and some individual sized pies too, for your supporters and you to take home...or enjoy there. Whichever. All proceeds go to Relay For Life of Douglas County to support the American Cancer Society. Dr. Joe with Sport and Spine will be at the finish line helping us out, performing stretches and Active Release Techniques (ART) for anyone that wants/needs it, and if you have any questions, he’d be happy to try and help. Our fruit is provided by those wonderful folks at the Merc. We’ll have a limited number of 2017 Pi Day Race Hoodies and neck gaiters for sale at the check-in tent, along with some Lawrence Trail Hawk swag. Your race shirts are by Atayne and are made with recycled materials and environmentally friendly inks. Thanks Atayne! 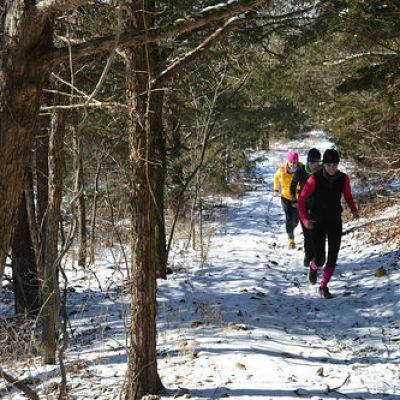 The Lawrence Trail Hawks, founded by Lawrence area trail and ultra runners, run on, promote and care for the Lawrence trails, including the Kansas River Trails (sometimes known as the Sand Rat trails), and the Clinton Lake North Shore Trails. We work with the Department of Parks and Wildlife and the Kansas Trails Council to help keep the trails groomed and free of trash. We stage events, and help with other groups' events that meet our goals of promoting and caring for the trails. We take care of the trails, our fellow Trail Hawk members, and all others who have interest in the trails similar to our own. We might not do as much as we’d like, but we do what we can. 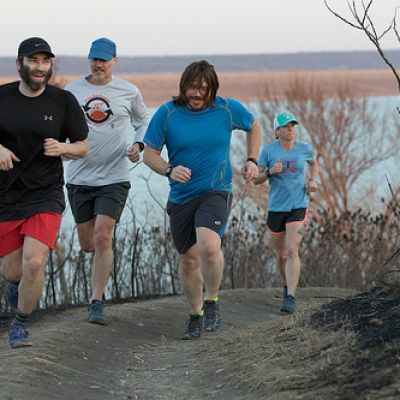 The Road Runners Club of America champions the development of community-based running clubs and events that serve runners of all ages and abilities in pursuit of health and competition. TL; DR (or Highlights): You may start checking in at 7 a.m. There will be multiple lines at the check-in tent, one for same day registration, and one for packet pick-up. If something happens and you need to drop out during the race, you need to check out with a Race Director. (Libby or Caroline) WATCH WHERE (AND WHEN) YOU PARK Your bibs need to be worn on your chest. Pi Miler begins at 8am Pi Day River Rotation begins at 9am Pie at the finish line! 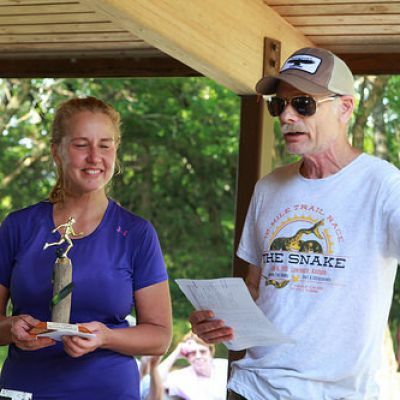 Awards for the Pi Miler will be given prior to the start of the Pi Day River Rotation Half Marathon. (8:35am) Awards for the Half Marathon will be given after at least 2/3rds of the runners have come though.